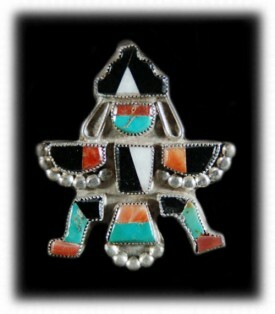 Silver Jewelry has been made by Native American Indians of the Southwestern United States since approximately 1860. Vintage Silver Jewelry has become highly collected and sought after by American Indian Historians and collectors of Western Americana. Collectors of Antique American Jewelry appreciate Antique Turquoise Jewelry and consider Vintage Silver Jewelry to be an important era of American History. Antique Navajo Turquoise Jewelry is most dominate when collecting Vintage Silver Jewelry followed by Zuni, Santo Domingo and Hopi. The Navajo Indians were the most ambitious in making Turquoise Jewelry in the early years and as it became more popular near the turn of the 19th century the Zuni Indians began making their style of Turquoise Jewelry. The Santo Domingo Indians of the Rio Grande Valley were making Turquoise Bead Necklaces early on (pre 1860) and were trading them to the Navajo as well as in Santa Fe. 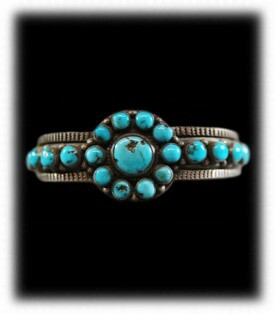 Turquoise began showing up in Navajo Jewelry around 1880, which was shortly after they began working with Silver. The first Vintage Silver Jewelry made by the Navajo Indians was fairly crude in today's standards as they made their Jewelry in open fire pits with bellows and ancient tools. Early antique pieces of Turquoise Jewelry were made by melting Silver coins, pouring them into ingots and hammering the ingots out into sheet and wire to be make into Jewelry. Vintage Silver Jewelry made from ingots is now very rare, highly collected and expensive. 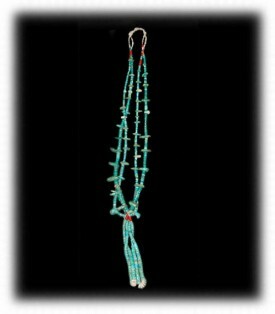 As demand for American Indian Turquoise Jewelry grew from the advent of tourism and Indian Traders bringing Turquoise Jewelry to the west coast to market it, Indian Jewelry became more refined. Sophisticated tools and gas torches started showing up around 1900-20 and quickly spread throughout the Indian Reservations of the Southwest and higher production of Turquoise Jewelry began. The Vintage Silver Jewelry from the 1900-1940 period is also highly collected as it to was totally made by hand with natural American Turquoise. 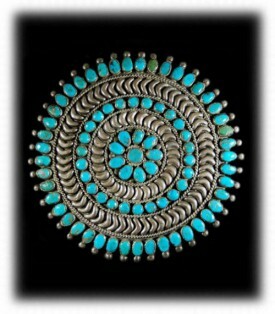 The Turquoise used in Antique Turquoise Jewelry plays an important roll in collecting Vintage Silver Jewelry as well. Turquoise has a completely different appearance from individual Turquoise Mines. Educated Vintage Silver Jewelry collectors can pinpoint the date the Vintage Jewelry was made by the type of Turquoise that was used in the Jewelry. Some of the early Turquoise Mines were the Cerrillos Turquoise Mine, Manassa Turquoise Mine, Number 8 Turquoise Mine, Blue Gem Turquoise Mines, Morenci Turquoise Mine and the Kingman Turquoise Mine. You can find more information on Turquoise Mines in our Turquoise Mines List and you can also find additional information on Vintage Silver Jewelry at our sister site. 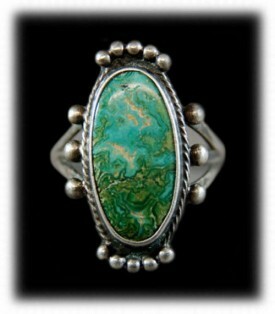 Durango Silver Company sells Vintage Silver Jewelry and have been noted as being leading authorities on Antique Turquoise Jewelry for decades as John Hartman has been a collector of American Frontier Items and his specialty has always been Antique American Indian Turquoise Jewelry. These two Antique Turquoise Bracelets were both Navajo Indian made from ingots of Coin Silver. The Navajo Indians would obtain U.S. Coin Currency from the U.S. Calvary than the Indian Traders, melt them down and pour them into ingots, which are Silver bars. They would than pound them out into sheet, in this case, and then work the silver with steel tools that they made themselves as well. The tools were made from the steel rims of the wagon wheels, old steel files and blacksmith steel. Blacksmithing started many years prior to Silversmithing. 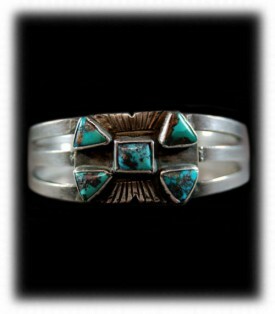 Atsidi Sani, believed to be the first known Navajo Silversmith began as a Blacksmith forging steel. To the left - Is an unusual Vintage Turquoise Ingot Bracelet, the Silver was pounded out of an ingot into sheet, it was then worked and two pieces of sheet were forged together in a fire pit to make the Bracelet Frame. 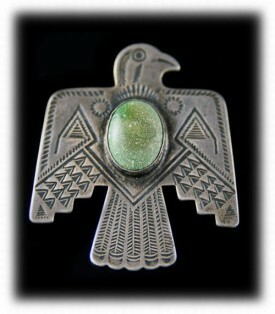 The Silver was then stamped and bezels were applied to accommodate The Turquoise Stones. To The right - Is a heavy, hand forged, Coin Silver Turquoise Ingot Bracelet with early Kingman or Morenci Turquoise. This Antique Turquoise Bracelet with hand sawed from an Ingot into The desired shape, hand stamped and bent to shape, then bezels were forged on The Bracelet Frame in an open pit fire with The use of bellows and solder made from mixing tin with silver. The Navajo would make The bezels fit The stones, then would strap them to The Bracelet Frame with thin steel wire to hold them into place while heating it up in The fire to forge The pieces together. These photos show two Vintage Silver Turquoise Cuff Bracelets from different periods of time. To The right - The Turquoise Cuff Bracelet was made at a much later date as it was made with factory fabricated Sterling Silver Sheet and wire that was purchased from a Trading Post or Jewelers Supply Company. It is a very nice second phase piece of Navajo Turquoise Jewelry that was made in a more refined and desired design of The 1930's to The 1950's. The Turquoise Stone looks like it came from The Tonopah, Nevada area - probably The Tonopah Blue Gem Turquoise Mine. This stone was cut with lapidary machines which is detected by The professional cut and The high polish of The stone. 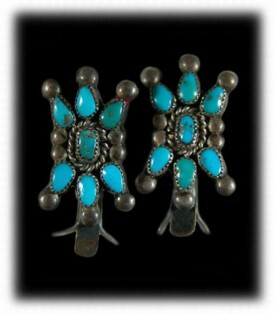 Hear are two beautiful Zuni Vintage Turquoise Pins made 1930-1950 period. 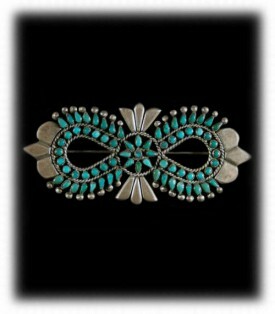 The Zuni Indians are famous for their stonework and in particular Needlepoint or Petit Point cut Turquoise Stones. These particular Vintage Pins have Petit Point cut Turquoise Stones that were cut by The artists that made each individual piece. To The left - An old Navajo Concho, probably from a Vintage Concho Belt, that was turned into a Belt Buckle. 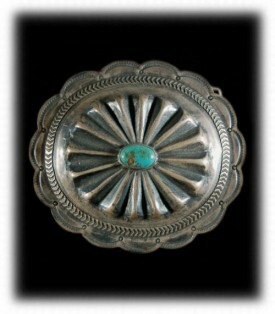 This Vintage Concho was handcrafted from Sterling Silver sheet. It has a reposed, fluted center that was stamped in a two piece hand made die set. The Silversmith would anneal The Silver to a dead soft state, put it over a female cut stamp and with a sledge hammer pound The male stamp onto The Silver Sheet driving it into The female part of The stamp that has The recessed flutes. Outside to The fluted center is a chased Silver Ring Design and then scallop stamped and filed edging. The Silver Concho was originally made between 1930-1950 period. To The right - A classic pair of Vintage Turquoise Earrings that are Zuni Indian made with squash blossoms and beautiful Battle Mountain Blue Gem Turquoise. This style of earring was made from 1930-1950 and were made for tourists as well as The Native American Indian women. We hope you have enjoyed our presentation on Vintage Silver Jewelry and have gained some useful knowledge from it. We invite you to learn more about Turquoise and Turquoise Jewelry by following The links in our Learning Center to other informational pages that we have written on different topics related to Turquoise Jewelry. In addition, we would like to invite you to join our E-Mail Newsletter - about once every other month we send out a Newsletter to inform our members of what's happening with Durango Silver Company, new products, specials for our members and more. We also have a monthly drawing from our member base to give away free Turquoise Jewelry from our company. Please take a moment to become one of our friends by signing in below. We hope you will think of Durango Silver company when you are looking for Vintage Silver Jewelry in The future.